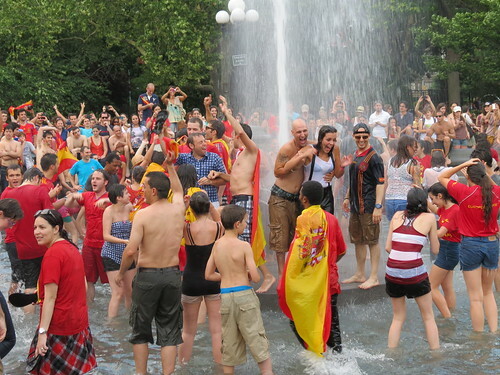 As Spanish soccer fans celebrated their Euro 2012 victory by thrashing in the Washington Square Park fountain yesterday afternoon, members of the East Village Book Club sat in a grassy corner of the park and pondered the birth of Frankenstein’s monster. 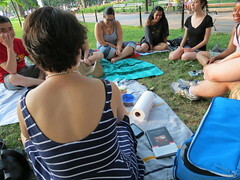 The book club had decided to take its monthly discussion, which usually occurs at Bar on A, outdoors for the first time since its inaugural meeting in Tompkins Square Park last November. “The movies massacred what the book was all about,” said Ranita Saha, a long-time member who commutes from the Bronx.